L takes me for a pleasant amble up Parliament Hill today, which is on Hampstead Heath, where in 1605 conspirators gathered with the intention of watching the Houses of Parliament go up in flames, giving rise to it's name. Then we head back to the Velodrome for both the afternoon and evening sessions. In the break between the sessions we attempt to find a decent pub but fail miserably. I’ve always wondered who placed the Olympic Park in a beer desert. So it’s pints of electrically pumped London Pride and Velodrome Curry (rather nice actually) instead. On the track, Andy Tennant beats team mate Owain Doull for bronze in the Pursuit, while the women’s Team Pursuiters redeem themselves from a horrible qualifying ride yesterday to also take bronze. 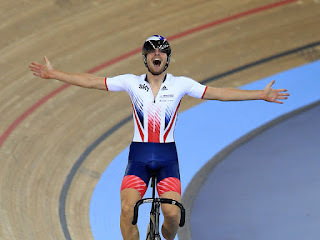 Mark Cavendish rides a decent Elimination Race in the Omnium to come in second but possibly shows his lack of understanding of the rules in failing to land the win. The start performer though in Jon Dibben, Cav’s rival for an Olympic Omnium place who bags a terrific Points Race win. We are urged to stay behind to help in the filming of a Sport Relief stunt involving Michael Crawford and Bradley Wiggins. This mainly involves a lot of jumping up and down on our part as well spanking the bottom of the person next to us. So expect numerous court cases for trauma and sexual assault to be filed retrospectively some time in the next thirty years. The woman next to me is far too keen and aggressive with her spanking. It's a good job I'm not the litigious type. After all that spanking we are too late to hit another pub so we have a glass of wine back at the hotel bar instead.